I am painting my bathroom counter and just realized that I don't know how to use the Envirotex on the existing back splashes without it running everywhere. Help. I am painting my countertops and am concerned about how my practice using envirotex went today. How do I use it for the back-splash part of the counter? Do I just pour a little and let is slide down toward the countertop? I've used Envirotex before and don't think the way you are suggesting will work because while you are pouring, it will just spread instead of building upwards. I think you are going to have to build some kind of frame work, like two pieces of wood as wide as you want the back-splash to be thick, but thin (like the size of a paint stirrer), then a piece of plexi glass. Work in areas like maybe a foot wide. 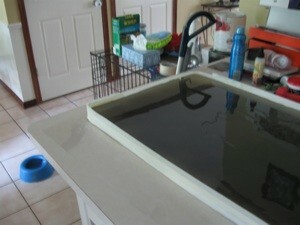 Stand this frame up where the back-splash is to go and pour the Envirotex in until it fills up the frame. Allow it to set up for a while, till it is thick enough not to run, but not so thick that the frame won't release. Keep repeating this process till you get the back-splash the length you want it to be.